He's susceptible to genetic skin disorders. Your West Highland white terrier might be a tough little guy, but skin problems can cause him a world of misery. If you notice skin issues on your Westie, take him to the vet as soon as possible for a diagnosis and treatment, before the problem gets really serious. 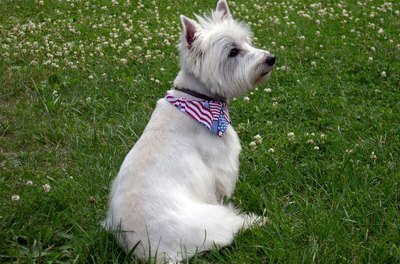 Westies suffer from various allergies, some of which may cause or exacerbate skin problems. Whether he's reacting to his food or airborne or environmental allergens, the subsequent skin sores and constant itching will likely require veterinary attention. Once testing is complete and the cause of the allergy is pinned down, your vet can give your dog medication or advise on dietary changes to alleviate symptoms. If you're lucky, your Westie may have a flea allergy, which is relatively simple to treat with a bath and topical flea control products. The yeast infection Malassezia dermatitis is an especially nasty condition affecting Westies, one that often goes misdiagnosed and improperly treated if the vet is unfamiliar with the breed. Yeast present on the dog's ears and skin grows at an alarming rate, causing foul-smelling, red, itchy skin. Without correct treatment, the skin turns black, hair falls out and the ears become infected. 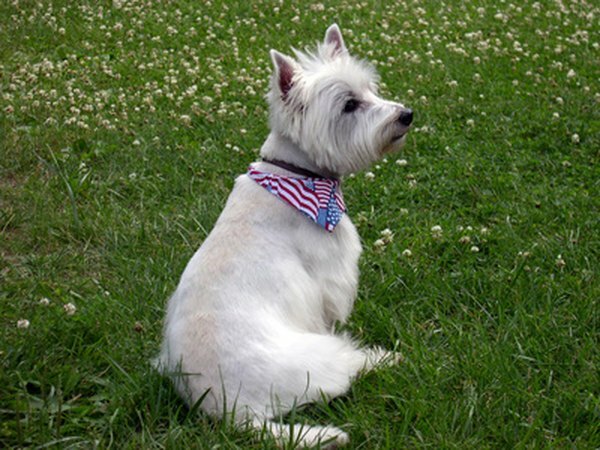 This condition is secondary to other Westie allergies that compromise the skin. Treatment consists of antibiotics, antihistamines, medication and topical treatment in affected areas. If your dog suffers from this disease, you may want to consult a veterinary dermatologist rather than your general practice vet. Common in Westies, this skin malady causes severe and constant itching. Most affected dogs display symptoms between the age of 6 months and 3 years, so if you have an older Westie manifesting skin problems it's probably not atopic dermatitis. It may be a seasonal condition, worsening in spring and fall due to pollen, mold and other environmental factors. Treatment includes antihistamines and topical medications. Your dog may also be a candidate for immune therapy shots, which eventually cause desensitization to the allergy triggers. Dry skin is the top skin problem facing Westies. Fortunately, it's among the most easily treatable. If your dog has dandruff that sheds all over the place or red patches on his dermis, suspect dry skin. He may also scratch like crazy, as if he has fleas. His scratching or gnawing just makes it worse -- take him to the vet for prescription, medicated shampoo and bathe him per the vet's advice. The vet may also suggest dietary changes or supplements to improve skin quality. Do Miniature Poodles Usually Have Skin Problems?